Why can’t a bicycle stand on its own? 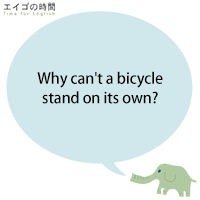 答え：Because it’s two-tired (too tired). Previous Post 砂糖の代わりに蜂蜜 – You can use honey instead of sugar.